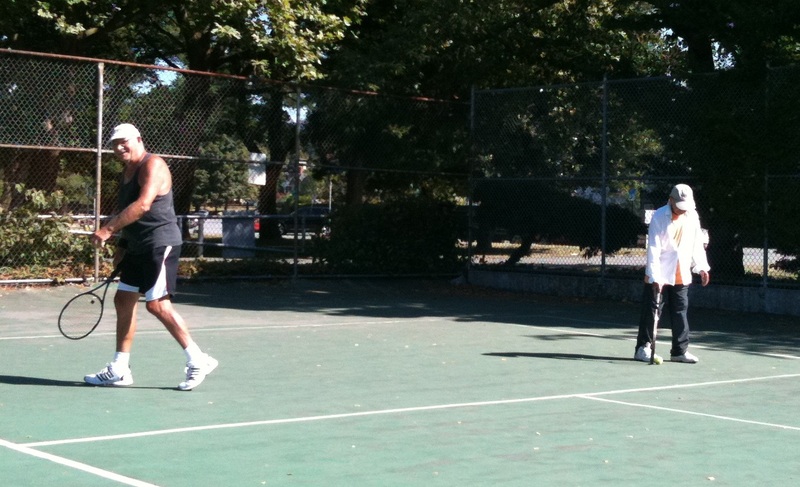 Not long ago, Husband and I visited the tennis courts at Kitsilano Beach, which is where we met a few years ago. 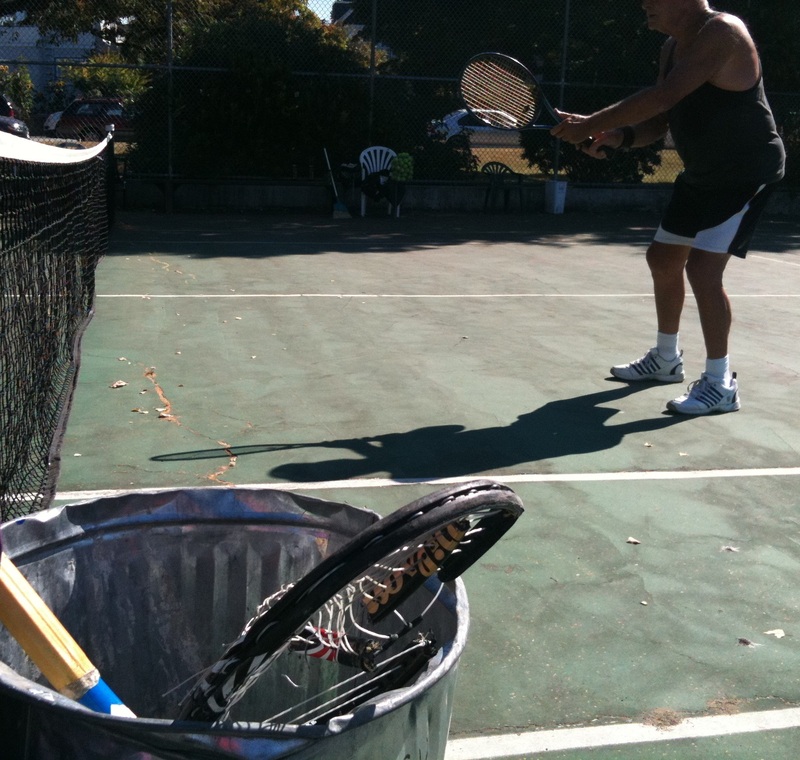 They are public courts, free, with certain guidelines for use – for example, only 30 minutes play if anyone is waiting. Of course there have always been the unofficial rules, cliques and status measures. Even in the old days, the crowd ranged from the good-looking cool 20-somethings with the right equipment and clothes (whether or not they could play) to a few eccentric older individuals who seemed to live their entire social lives on the courts. My husband was a respected regular because he was a good tennis player and he did not care one iota what anyone thought of his clothes. I was more of a hanger-on because I was a lousy player, mainly looking for a husband, which I found. At the courts we only saw people wearing their tennis personas. Maybe they had spouses and families. Occasionally one would be sighted or mentioned – “Oh, is that your wife over there?” Or “I think so-and-so is on vacation with his kids.” But from the perspective of the tennis court, those unseen relationships seemed secondary in their lives. Do you remember John McEnroe playing Bjorn Borg at Wimbleton (1980)? Everyone stayed home to watch it, and then gathered at Kits Beach for analysis. Every 10 years or so, we have passed by those courts and seen someone we knew, but usually we were with kids or en route somewhere and didn’t take much time. However, this week we have been staying in the neighbourhood so early on Saturday morning husband bicycled over to the courts with his racket. I showed up a while later and had a moment of déjà vu. There was my husband – sitting on his bike between the courts, chatting with the most infamous of the eccentric tennis players, in the same place and same manner as 30 years ago. From the distance I couldn’t see the lines and grey hairs that weren’t there in those days. The old-timer was frustrated that he couldn’t remember my husband’s name, although he had immediately recognized him. My husband wouldn’t tell him, the fellow wracked his brains for some time, trying to remember. Eventually he did and was very pleased with himself. Over the next hour, several old-timers showed up. They all occupied “their” court, with lawn chairs, etc. set up. And they played a bit of tennis. My husband is still a good player so he found other partners, but I spent the time being entertained by the geriatric game on Court One. They were playing doubles with one “youngster” (probably in her 50s), one portly fellow of the same age, our eccentric friend (must be mid-70s now) and an 84-year-old. The play was slow and the banter quick – filling the time taken to fetch stray balls, distracting attention from the bad shots, and slowing the play to conserve energy. No one ran for a shot; a brisk walk was the limit. The 75-year-old (in white shirt) used the tricky rinky-dink spins that he was perfecting even 30-years-ago, and that are almost impossible to return. The 84-year-old (black muscle shirt) was very careful to stop play whenever there was a stray ball on the court, so no one would trip on it and break an ankle like he apparently did once. The portly guy had a cigarette during the play. As they changed sides after each game, that was enough excuse to stop for a drink, chat with the spectators, comment on other games, etc. I’ll leave the difficult points to you… All the points are difficult. Good thing that shot was out. I would have had to leave yesterday to get it. I wore my black muscle shirt today because it is slimming… We see the black shirt, but where are the muscles? On a lucky/good point: You are a horrible old man. On another good point: You obviously took your meds today. Was that out?… When in doubt, I call it out. It was fun to watch. McEnroe and Borg aren’t so young anymore, either. Here is a more recent update. September 24, 2011 in Favourite posts. Thank you. It will be a challenge to follow-up, but I’ll do my best! I know, it’s challenging to follow-up. I got one of those awards and you would have been one of the people I nominated. So that’s two! Thanks! I have finally finished my response and it should be up soon. Hope you’ll excuse my irreverance! I AM pleased with the nomination. There’s nothing like verbal tennis.